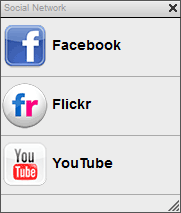 The social network application provides online access to social networking sites such as Facebook, Flickr and Youtube. The application allows you to share your media files with the social network community directly from within the web interface of the network drive. The Facebook application allows you to post your images from the network drive to your Facebook album(s). Click on the Facebook icon to open the application. Depending on your browser's security settings, you may have to temporarily allow pop-up windows in order to login to Facebook. Please keep an eye on any warnings from your browser after you click on the Facebook icon. Click Login to log into your Facebook account. 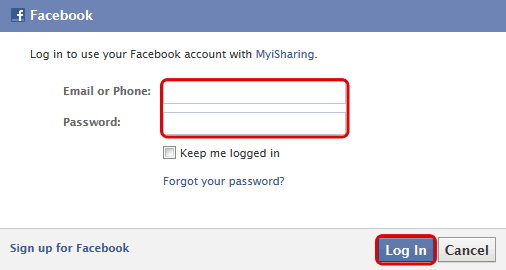 Enter the email and password of your Facebook account and click Log In. Click Log In with Facebook. 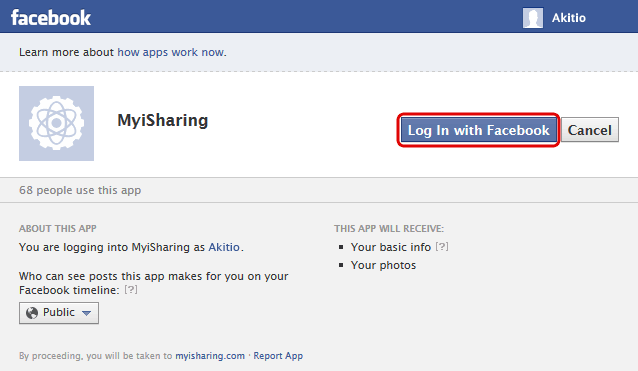 Click Allow to give the MyiSharing application access to your Facebook account. If you already have some photo albums on your Facebook account, you can now select one of your albums from the list or click on the first green plus sign to add a new album. Enter a name for the new album and click OK to create it. Select the album from the list and click on the second green plus sign to add some photos. Locate the images that you would like to post on Facebook, select them and then click Open. Your photos are now available for your friends to see on Facebook. Depending on your browser's security settings, you may have to temporarily allow pop-up windows in order to login. The Flickr application allows you to post your images from the network drive to your Flickr photostream. Click on the Flickr icon to open the application. Depending on your browser's security settings, you may have to temporarily allow pop-up windows in order to login to Flickr. Please keep an eye on any warnings from your browser after you click on the Flickr icon. 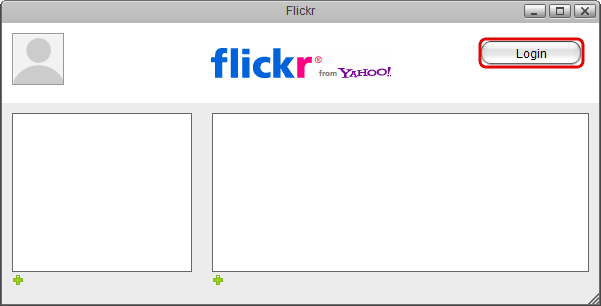 Click Login to log into your Flickr account. 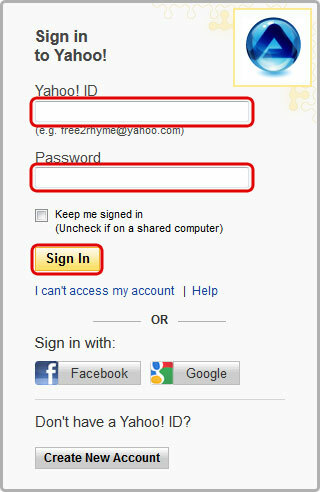 Enter the Yahoo ID and password of your Flickr account and click Sign In. 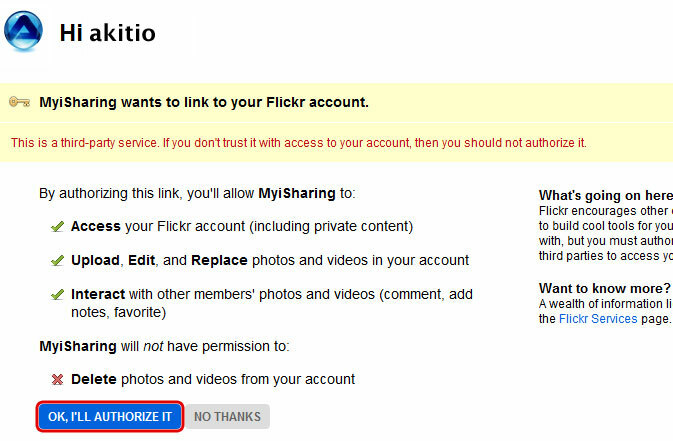 Click OK, I'LL AUTHORIZE IT to give the MyiSharing application access to your Flickr account. If you already have some photo sets in your Flickr photostream, you can now select one of your sets from the list. Otherwise, select a photo that you would like to add to the new set and click on the first green plus sign to add a new set. Enter a name for the new set and click OK to create it. Select the set from the list and click on the second green plus sign to add some photos. Locate the images that you would like to post in your Flickr photostream, select them and then click Open. Your photos are now available for your friends to see on Flickr. In order to add a new set, you have to select an image first. 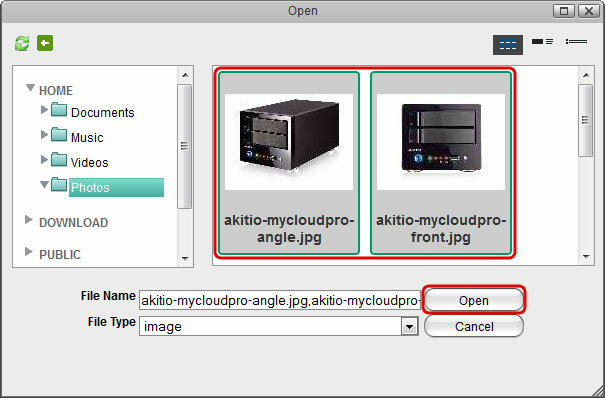 If your photostream does not contain any images yet, upload at least one image first before you create a new set. The YouTube application allows you to post your videos from the network drive to your YouTube account. Click on the YouTube icon to open the application. Depending on your browser's security settings, you may have to temporarily allow pop-up windows in order to login to YouTube. Please keep an eye on any warnings from your browser after you click on the YouTube icon. Click Login to log into your YouTube account. 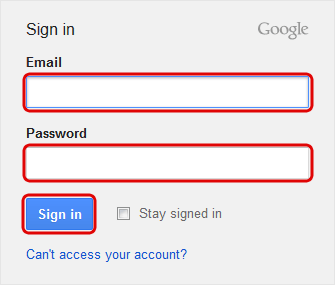 Enter the email and password of your Google account and click Sign in. Click Grant access to give the MyiSharing application access to your YouTube account. Click on the green plus sign to add some new videos. 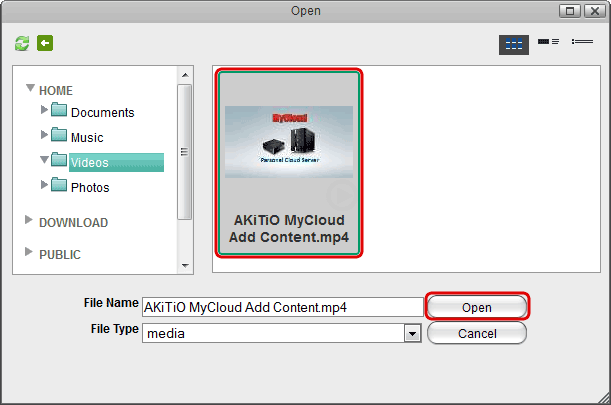 Locate the videos that you would like to upload to your YouTube account, select them and then click Open. Your videos are now available for your friends to see on YouTube.